The Electro-Harmonix Enigma is a powerful and precise envelope filter fine-tuned for bass frequency response. Sculpt your envelope to reveal a truly expressive tone, with a defined and unique signature. Enigma will deliver tight and smooth control over the complete 40 Hz to 3 kHz range, with a consistent and even sweetness. Need some edge? Engage Enigma's analog distortion and dial in anything from subtle bite to dominating crush. You can even plug in an optional expression pedal to control the filter sweep with your foot. With the ability to adjust Q, sweep range, and filter type, you'll also wind up with of the most versatile wahs available. 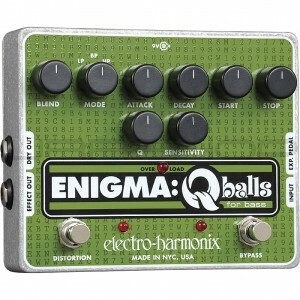 Enigma: a mysteriously musical envelope filter for bass guitar.